Today, as I sat on the couch with my morning cup of coffee, I noticed something different. Instead of thinking about all the things I’m not doing, the food I’m not eating, the person I’m not becoming, I was thinking about the opposite. And I was noticing that this change is not a momentary blip in an otherwise ordinary morning, but something deep down that has actually transformed. Having a daily creative practice has lightened up my life. 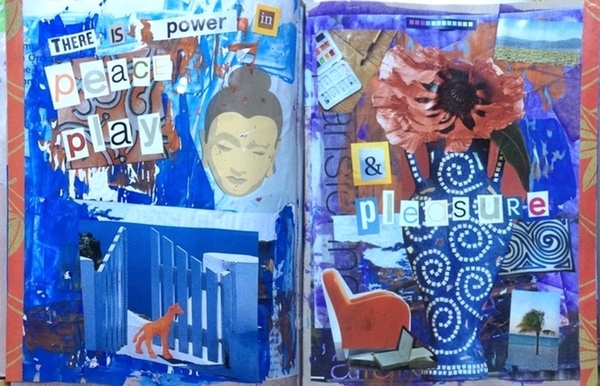 When I’m working in my visual journal, I am having a personal conversation with myself. Not the self that is enjoying this beautiful Sunday morning. But rather the deep Self that doesn’t often get a chance to speak. When I’m sitting at the table, my journal in front of me, I never know where I’m going. The colors beckon, the images delight and suddenly one is chosen. There is paint involved, glue and often, colored pens and markers. I feel myself gently enter the flow, where nothing else matters but that which is before me. My whole BEing smiles. Sometimes it is in the middle of the journey, or sometimes not till the very end, that I know or understand what it is I’m creating. Sometimes the journey is rough, confusing and unclear, as nothing makes sense. Through persistence, through patience and sometimes a night’s rest, the next step always emerges. Thus far, the journey has taken me on the ride of my life. Literally, I comb the depths of my soul for information that leads me to discover more of who I really am. As this is happening, I realize I’m significantly more content with almost everything. I no longer have the desire to numb myself with meaningless distractions. After years of struggling with food cravings, I find that I can easily sit next to my husband as he crunches on chips, or enjoys French bread and pastries. I’m not even tempted. When I feel troubled or the desire to explore something, I know exactly where to go. I sit down and lose myself in my visual journaling, only to find the most precious of gifts. I take the first steps into the unknowning and trust that the process will do as it always does, show me the way. I pour out my deepest emotions and receive the grace of understanding and wisdom. The most amazing gift of all is that everything I experience in my journal, I can take into life. The creative process transfers directly to life, making life a whole lot more fun. Simple color and interesting shapes make up stories that emerge out of nothing. As I look at my table even now, I know the joy will never end because there is always something new and different to discover. Always a mystery to unveil or a question to be answered. Here, in the pages of my journal, I’ve found my sanctuary, my soul space, my heartbeat. And I’ve found this most incredible lightness of BEing. 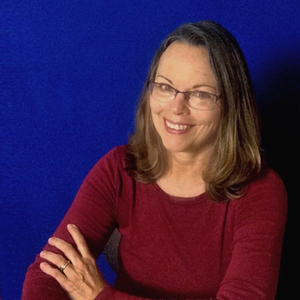 Linda Hough helps women change-makers find the creative confidence to know who they are + what they are here to do so that they can do more of it. Whether you want to change the world or your own life circumstances, learn how to use your creative superpower to help create the new world you want to live in. Read more about Linda here.